Its been quite a while since I have posted on here, being swept up in the polarities of this season. Trying to find balance btween them and find the center of my own sense of peace and good will. 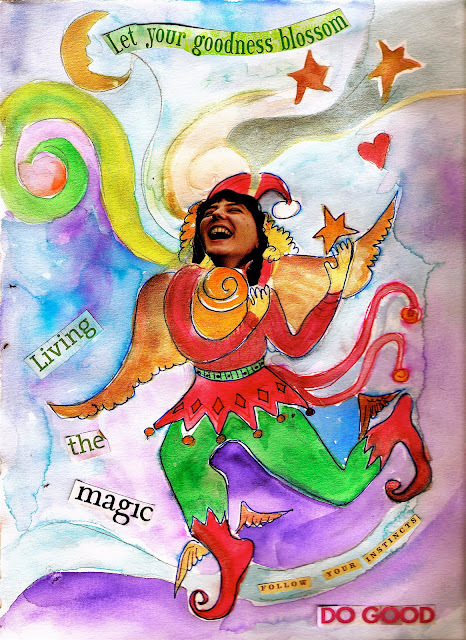 I have been receiving some wonderful inspiration from Lynn Jericho's Inner Christma s guide and website. If you to have been longing to find balance and equilibrium seasonal needs for spiritual fulfillment and the material too muchness of this time of year I recommend her work heartily. She offers a free pdf on her website of her inner Christmas Guide.
" Reflecting the natural world, the soul seasons transform at solstices and equinoxes. The light and the dark aspect of our inner lives move from attention to ourselves as earthly beings to attention to ourselves as spirituals beings and returns. In summertime's light and warmth, our souls embrace our intense perceptions of the world. But in the dark cold silence of early winter, our souls turn inward seeking the Spirit." Many blessings to all... follow your instincts for goodness, let the magic happen. Happy Solstice. The day after Thanksgiving my Women's Art Medicine Group met and we created gratitude scrolls. This is what I created. I added this to my gratitude blessing book which is an ongoing process for me. I fall out of it and then life situations remind me to remember what I am grateful for and that being in a state of gratefulness is a form of prayer for me. find balance amid lifes varying changes. is an integral part of the creative process for me. I am grateful as well for this venue.